It’s an old game: blame the innocent and make the innocent look guilty. What Israel built was not a border, but a barrier against death and destruction. What Israel built was protection, not apartheid. The separation wall between North and South Korea is armed and mined. Yet, the UN remains largely silent as to North Korea’s terrorism of its own people. As the world mourns the passing of Nelson Mandela and reflects upon his lifelong fight against racial injustice, his lengthy imprisonment and his ultimate defeat of apartheid as President of South Africa, it is quite appropriate to examine the origins, concepts, applications and misapplications of apartheid. Much will be written about President Mandela’s bold stands, deep commitment to truth and justice, his legacy and lessons learned. Much less will be said about the ugly and wrongheaded accusation that Israel is an apartheid racist criminal state. Such an accusation, equating Israel with the racist criminal state against which Mandela heroically fought, not only maligns Nelson Mandela, but ignores Israel’s rich history as a defender of human rights for all peoples. This slander does nothing to promote truth or justice. In this context, let us remember that exactly ten years ago on December 9th, 2003 the United Nations General Assembly (“UNGA”) adopted a resolution referring the question of the “legal consequences” of the Israeli-constructed security fence to the International Court of Justice (“ICJ”). This resolution, preceded by decades of maligning Israel at the United Nations, was contrary to any semblance of objectivity and in violation of the UN Charter. The apartheid accusation campaign against Israel has indeed hijacked the very concept and illegality of apartheid in a concerted effort to deceptively tell the world that Israel is today, like South Africa was before Mandela, an apartheid racist criminal state. This propaganda war seeks to expose Israel to liability at the International Criminal Court. This devious plot is in the same nature as the ploy to drag Israel before the International Court of Justice for an advisory opinion relating to Israel’s construction of the terrorism prevention security fence/barrier. Moreover, the attempt to equate Israel’s security actions as an act of apartheid completely disregards the reality of the raging Second Intifada which was ongoing ten years ago. Fencing out the terrorists served as a legitimate exercise of meeting Israel’s right and obligation to defend and protect her people. It’s an old game: blame the innocent and make the innocent look guilty. 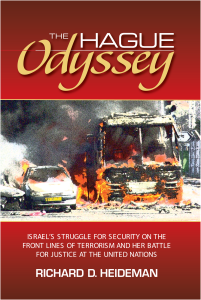 After the commencement of the Second Intifada campaign of orchestrated terrorist bombings and heinous suicide attacks across Israel in late September of 2000, Israel took the necessary steps to route, design and construct a security line to keep out terrorists, suicide-homicide-bombers, and munitions and to guard against grenade and missile attacks from the Palestinian territories. In 2001, 2002 and 2003, these activities conducted by Palestinian terrorist organizations continued to threaten lives and security across Israel. No one was spared the fear inflicted by these murderous attacks upon schools, buses, restaurants, nightclubs, shopping malls, religious sites and family gatherings. In this climate of danger and with a commitment to protect innocent human life and achieve a lasting peace through security, construction of the fence ensued. The response was an outcry that Israel was interfering with the lives and livelihood of the Palestinians near the fence line and was taking steps to separate the Israelis and Palestinians. Misguided opponents accused Israel of unilaterally establishing a border. In truth, what Israel built was a security barrier, movable upon the cessation of terrorism, an integral part of achieving an everlasting peace between Israel and the Palestinians. In fact, approximately 95% of this “wall” is merely a fence; the remaining five-six percent is composed of concrete akin to expressway Jersey walls. Of necessity, these concrete portions guard against rocks, boulders, grenades and munitions. What Israel built was not a border, but a barrier against death and destruction. What Israel built was protection, not apartheid. Central to the necessity of the security fence was the fact that the vast majority of weaponry and terrorists originated from within the portions of Judea and Samaria, the West Bank of the Jordan River, controlled by the Palestinian Authority (PA). Indeed, the fence guaranteed that terrorists and weapons could no longer avoid detection by exiting PA controlled regions of Judea and Samaria through the wilderness or unguarded border crossings. As a result, the number of suicide bombings and terrorist attacks in Israel dropped significantly. However, the threat of even one event, the killing of even one person, is intolerable for any nation-state; and intolerable for Israel. After the UN Security Council refused to adopt a resolution in 2003 condemning Israel’s construction of the security fence, those opposed to Israel’s very existence bypassed the UN Security Council and introduced in the UN General Assembly the resolution referring the matter of the fence to the ICJ. In a display of unbridled bias, the resolution suggested that the fence was tantamount to Israel, the “Occupying Power” acquiring territory by force and thus acting violative of the principle of equal rights and self-determination of peoples. Under the guise of fighting a non-existent apartheid, the prejudiced opponents of Israel deceptively attempted to divert the focus away from terrorism and toward their own biased aims.. In a hijacking of truth and miscarriage of justice, the world forgives the terrorists and forgets the victims. Such has been the case regarding Israel, as those who committed the terrorism seem to have been forgiven, while those who have suffered have been forgotten; and Israel, standing up for her people against the terrorists, has been mercilessly maligned. Ironically, among the supporters of the UNGA resolution referring the matter to the International Court of Justice was North Korea. This brutal dictatorship hardly possesses the moral credibility to render a judgment on a security fence, as it has long refused to allow its starving citizens to freely travel into prosperous South Korea. The separation wall between North and South Korea is armed and mined. Yet, the UN remains largely silent as to North Korea’s terrorism of its own people, while castigating Israel year after year, session after session.. Moreover, in 2004, the ICJ issued its Advisory Opinion on the security fence. The opinion gave no credence to the necessity of the State of Israel to construct the barrier as a preventative measure against terrorist attacks nor did it provide any deference to the decision of the Israeli High Court of Justice ordering rerouting of portions of the security barrier. Notwithstanding world pressure, principled Israeli leadership has refused to cave in to both the biased UN General Assembly and an ICJ operating without lawful jurisdiction. Indeed, the Israeli government possesses a sacred obligation, and the absolute right, to defend and protect her people and to assure security for Israel and her people. Until the Palestinians choose to live side by side in peace and security with Israel as its neighbor, the fence will continue as an important part of meeting that duty. For not only during the past ten years, but for decades, Israel has weathered the bigoted misrepresentation of her true intentions to attain peace through security and the constant attempt to blame her for acts not done. Ten years since the adoption of the UN General Assembly Resolution wrongly referring the issue of the security fence to the ICJ, one thing is clear: Israel has acted rightly and out of necessity in building the barrier. While Israel patiently awaits the day when the protections it affords will no longer be necessary, the maligning of Israel continues, with the accusation of apartheid as the mantra. As the “heart of South Africa”, Mandela’s legacy of standing against apartheid in South Africa is legendary. Likewise, Israel and the Jewish people possess a legacy deserving of respect by the entire world: a proven dedication to the principles and watchword of the Jewish people thousands of years ago of “Justice, Justice Shalt Thou Pursue”. Israel’s protection of human rights, care for the sick and downtrodden, respect for the dignity of each person and commitment to the rule of law, bear testament to this pursuit. Indeed , Israel and the Jewish people deserve both respect and admiration—not the unjust and untrue accusation of having committed apartheid. *Richard D. Heideman serves as Senior Counsel of the Washington, DC law firm Heideman Nudelman & Kalik, PC, representing victims of terrorism and international human rights violations and is the author of The Hague Odyssey: Israel’s Struggle for Security on the Front Lines of Terrorism and Her Battle for Justice at the United Nations (Bartleby Press, 2013; see thehagueodyssey.com). Contact: info@thehagueodyssey.com. Copyright © 2013 · Richard D. Heideman. All Rights Reserved.